↑ SAIDEMAN, STEPHEN (12 March 2014). "In Crimea's sham referendum, all questions lead to 'yes'". Globe and Mail. ...voters in Crimea next Sunday will be asked whether they support the union of Crimea with Russia (an act of irredentism) or whether Crimea should be independent (secession). There is no alternative – one cannot vote for the status quo ante of remaining within Ukraine. ↑ "BBC News - Crimea exit poll: About 93% back Russia union". Bbc.com. สืบค้นเมื่อ 2014-03-17. 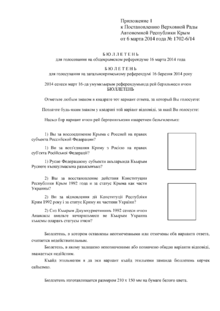 ↑ "Current Events: Russia media say Crimea votes 93 pct to quit Ukraine". Vision.org. สืบค้นเมื่อ 2014-03-17. ↑ "Crimea votes to leave Ukraine in secession referendum and join Russia - World - CBC News". Cbc.ca. สืบค้นเมื่อ 2014-03-17. ↑ Balmforth, Richard (Mar 11, 2014). "No room for 'Nyet' in Ukraine's Crimea vote to join Russia". Reuters. สืบค้นเมื่อ 16 March 2014. ↑ 16:35. "Mejlis to boycott Crimean referendum| Ukrinform". Ukrinform.ua. สืบค้นเมื่อ 2014-03-15. ↑ "Tatar leader: referendum's results 'predetermined' | World | DW.DE | 16.03.2014". DW.DE. 2012-08-15. สืบค้นเมื่อ 2014-03-17. ↑ "Security Council Fails to Adopt Text Urging Member States Not to Recognize Planned 16 March Referendum in Ukraine's Crimea Region". Un.org. 2013-01-02. สืบค้นเมื่อ 2014-03-17. ↑ "Russia Vetoes U.N. Security Council Resolution On Crimea". NPR. 2014-03-15. สืบค้นเมื่อ 2014-03-17. หน้านี้แก้ไขล่าสุดเมื่อวันที่ 18 เมษายน 2557 เวลา 11:24 น.